Say bye bye to Irv’s Burgers. The West Hollywood institution is closing on Saturday. Saturday’s closing marks the end of several years of uncertainty for Irv’s, which has been in existence under one name or another since 1946. Originally located at 8289 Santa Monica Blvd. near Sweetzer, it was known as Queenies and then Joe’s until it was purchased in 1970 by Irv Gendis. At one point it was known a hangout for rock stars such as Jim Morrison of The Doors. Hong bought the place from Gendis in 2000 and ran it with her mother, known as Mama-Soon, and her brother Soo (Sean) Hong, who died in September of last year. 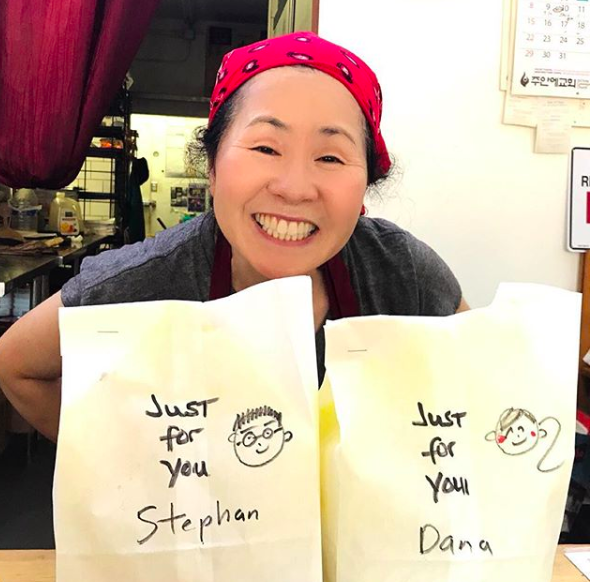 Under the Hong’s ownership, Irv’s became known as a community institution, famed as much for Sonia’s handwritten remarks on the paper plates and bags as for the burgers. In recent years, the Hongs faced several efforts to demolish Irv’s. The City of West Hollywood designated Irv’s Burgers as a cultural resource in 2005 after a campaign dubbed the “Burger Brigade” that was sparked by the property owner’s plan to demolish Irv’s and use the area for parking for a Peet’s Coffee planned for the adjacent lot. That lot later became the site of Beach Nation, an outdoor restaurant that closed not long after it opened. Irv’s closed in October 2013 after being served an eviction notice by Standard Oil, the owner of its lot and that of Beach Nation, which had attempted to double Irv’s lease. It moved to its current location at 7998 Santa Monica Blvd. near North Laurel. The former Irv’s site on Santa Monica and Sweetzer is home to the recently opened Conservatory, a project of Paul Kalt’s the Kalt Group. The Conservatory offers a decidedly more expensive menu and an international list of fine wines. SOO SAD! Wish we could keep Irv’s and 86 Whalbergers @ Sunset Plaza. I will have to go before Saturday. I enjoy their burgers, but only eat one every so often. I will miss having a little private biz on the blvd. though. Ohhh nohhh, say it ain’t sooohh! My difficulty walking has prevented me from being as regular a patron lately as I used to be, but I still get my to-go lunches from Irv’s every month or so. I was a fan at the old location as well. I/We will miss you Sonia (and Mama of course)! I hate to see a small business close. Unfortunately, I never ate at the old Irv’s because the owners never put any money into the place and it looked run down and dirty. I never tried their current location. Wish them all the best. Sad to hear this. While never a patron it seems the heavy hand of Karma struck Beach nation. Why wouldn’t it be possible for a place like Laurel Hardware to adopt this small humble establishment as a satellite. Weho could also fund their own rather than have businesses like this be consumed by runaway development and avaricious property owners.